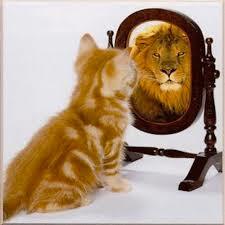 I can relate to that picture of the cat seeing himself as a lion. I must say, I have to reflect on my own motives sometimes, so I frequently ask coworkers how I am doing, how do they see me. It really helps me stay on track. I have been in the classroom on a daily basis and I know it is easy to let some of the things you mentioned block main focus – the youth. One thing that helps me is to remember to not take things personally. Whether it is criticism from a parent or coworker, it should not affect my attitude toward them. But I think the hardest issue for me to address, would be related to my responsibility to speak up, as you mentioned. So that gives me something to work on. Sorry for the late response, somehow I missed this. Good for you for soliciting feedback! That takes courage, as well as strong relationships of respect to obtain valuable feedback. I’m interested to hear how your focus to speak up has come along this year.